hsv = hsvd(sys) computes the Hankel singular values hsv of the dynamic system sys. In state coordinates that equalize the input-to-state and state-to-output energy transfers, the Hankel singular values measure the contribution of each state to the input/output behavior. Hankel singular values are to model order what singular values are to matrix rank. In particular, small Hankel singular values signal states that can be discarded to simplify the model (see balred). For models with unstable poles, hsvd only computes the Hankel singular values of the stable part and entries of hsv corresponding to unstable modes are set to Inf. hsv = hsvd(sys,opts) computes the Hankel singular values using options that you specify using hsvdOptions. Options include offset and tolerance options for computing the stable-unstable decompositions. The options also allow you to limit the HSV computation to energy contributions within particular time and frequency intervals. See hsvdOptions for details. [hsv,baldata] = hsvd(___) returns additional data to speed up model order reduction with balred. You can use this syntax with any of the previous combinations of input arguments. hsvd(___) displays a Hankel singular values plot. Create a system with a stable pole very near to 0, and display the Hankel singular values. Notice the dominant Hankel singular value with magnitude 105, which is so much larger that the significant digits of the other modes are not displayed. This value is due to the near-unstable mode at s=10-7. Use the 'Offset' option to treat this mode as unstable. The Hankel singular value of modes that are unstable, or treated as unstable, is returned as Inf. Create a Hankel singular-value plot while treating this mode as unstable. The unstable mode is shown in red on the plot. By default, hsvd uses a linear scale. To switch the plot to a log scale, right-click on the plot and select Y Scale > Log. For information about programmatically changing properties of HSV plots, see hsvplot. To create a Hankel singular-value plot with more flexibility to programmatically customize the plot, use hsvplot. Large Hankel singular values for the stable part. This happens when the stable part G_s contains some poles very close to the stability boundary. To force such modes into the unstable group, increase the 'Offset' option to slightly grow the unstable region. Too many modes are labeled "unstable." For example, you see 5 red bars in the HSV plot when your model had only 2 unstable poles. The stable/unstable decomposition algorithm has built-in accuracy checks that reject decompositions causing a significant loss of accuracy in the frequency response. Such loss of accuracy arises, e.g., when trying to split a cluster of stable and unstable modes near s=0. Because such clusters are numerically equivalent to a multiple pole at s=0, it is actually desirable to treat the whole cluster as unstable. 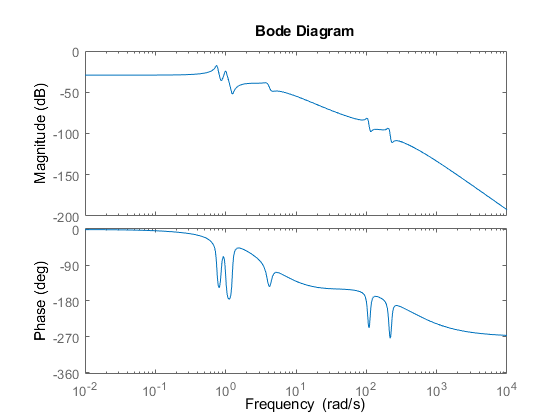 In some cases, however, large relative errors in low-gain frequency bands can trip the accuracy checks and lead to a rejection of valid decompositions. Additional modes are then absorbed into the unstable part G_ns, unduly increasing its order. Such issues can be easily corrected by adjusting the AbsTol and RelTol tolerances. By setting AbsTol to a fraction of smallest gain of interest in your model, you tell the algorithm to ignore errors below a certain gain threshold. By increasing RelTol, you tell the algorithm to sacrifice some relative model accuracy in exchange for keeping more modes in the stable part G_s. If you use the TimeIntervals or FreqIntervals options of hsvdOptions, then hsvd bases the computation of state energy contributions on time-limited or frequency-limited controllability and observability Gramians. For information about calculating time-limited and frequency-limited Gramians, see gram and .